Norwich City manager Daniel Farke says his side must not get carried away after going top of the Championship. 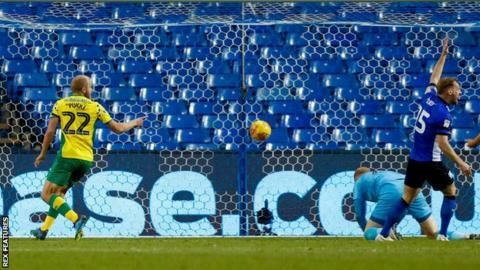 The Canaries thrashed a poor Sheffield Wednesday side 4-0 - their first win at Hillsborough in almost 17 years. "We all have our feet on the ground," Farke told BBC Radio Norfolk. "We know we have had a decent start, and to be there after 16 games with 30 points already is outstanding." "But we know we can't relax and we can't enjoy ourselves too much. We need at least six more wins to at stay in this league. "If we relax just a bit and think about the beach or whatever we won't win any points, so it's important we go for them." Norwich missed a golden chance to lead after five minutes when Mario Vrancic saw his tame penalty easily saved by Cameron Dawson. But they took advantage of a shaky Wednesday as they scored three times in a 10-minute spell soon after half time. Teemu Pukki - playing in the league for the first time in three weeks after injuring his hamstring while playing for Finland - put City ahead as he converted after Vrancic's shot was deflected into his path. Static defending then allowed Emiliano Buendia time to turn and fire home before Pukki tapped in the third from Max Aarons' ball into the box. Late substitute Dennis Srbeny made it 4-0 with his first touch after Dawson's poor clearance fell to Vrancic, who played the substitute in. Norwich have won eight of their past 10 league games, including a run of four consecutive victories, while the loss increases the pressure on Wednesday boss Jos Luhukay as his side have now lost four in succession, conceding 12 goals in the process. Booing Owls fans chanted the names of out-of-favour duo Keiren Westwood and Sam Hutchinson after a performance that lacked confidence and cohesion. Norwich last won at Wednesday in December 2001, losing 5-1 on their previous two visits to Hillsborough, and they could have gone behind after three minutes when Josh Onomah blazed over from close range. But Norwich had a number of chances to add to their lead, the best arguably with 15 minutes left as a mazy run from Onel Hernandez forced Dawson to palm the ball behind. Sheffield Wednesday manager Luhukay said the performance was "not good enough". "We must be very quick to bring our best performances back," he told BBC Radio Sheffield. "Before the international break it was very positive, and now it is negative - that is football and you must fight against this. "Sometimes it looks like we don't have the stability to clear at moments when you can clear. At this level and in this league that's not possible and our opponents profited from the mistakes that we made." Match ends, Sheffield Wednesday 0, Norwich City 4. Second Half ends, Sheffield Wednesday 0, Norwich City 4. Corner, Norwich City. Conceded by Cameron Dawson. Attempt saved. Marco Stiepermann (Norwich City) left footed shot from the centre of the box is saved in the bottom left corner. Assisted by Dennis Srbeny with a through ball. Substitution, Norwich City. Ben Godfrey replaces Moritz Leitner. Substitution, Sheffield Wednesday. Fraser Preston replaces Steven Fletcher. Attempt blocked. Lucas João (Sheffield Wednesday) right footed shot from the centre of the box is blocked. Assisted by Liam Palmer with a cross. Attempt missed. Mario Vrancic (Norwich City) right footed shot from outside the box is high and wide to the right. Assisted by Jamal Lewis. Attempt saved. Dennis Srbeny (Norwich City) right footed shot from the centre of the box is saved in the bottom right corner. Attempt saved. Onel Hernández (Norwich City) right footed shot from the left side of the box is saved in the centre of the goal. Assisted by Moritz Leitner with a through ball. Substitution, Norwich City. Marco Stiepermann replaces Emiliano Buendía. Attempt missed. Adam Reach (Sheffield Wednesday) left footed shot from outside the box misses to the right. Assisted by Lucas João following a corner. Substitution, Sheffield Wednesday. Jordan Thorniley replaces Daniel Pudil. Corner, Sheffield Wednesday. Conceded by Timm Klose. Goal! Sheffield Wednesday 0, Norwich City 4. Dennis Srbeny (Norwich City) right footed shot from the centre of the box to the bottom right corner. Assisted by Mario Vrancic with a through ball. Matt Penney (Sheffield Wednesday) is shown the yellow card for a bad foul. Foul by Matt Penney (Sheffield Wednesday). Attempt blocked. Lucas João (Sheffield Wednesday) header from the centre of the box is blocked. Assisted by Liam Palmer with a cross. Hand ball by Jamal Lewis (Norwich City). Lucas João (Sheffield Wednesday) is shown the yellow card for a bad foul. Attempt missed. Steven Fletcher (Sheffield Wednesday) left footed shot from outside the box is close, but misses to the left. Assisted by Barry Bannan. Attempt saved. Onel Hernández (Norwich City) right footed shot from the left side of the box is saved in the bottom left corner. Assisted by Jamal Lewis. Substitution, Sheffield Wednesday. Lucas João replaces Atdhe Nuhiu. Atdhe Nuhiu (Sheffield Wednesday) is shown the yellow card for a bad foul. Christoph Zimmermann (Norwich City) wins a free kick in the attacking half. Attempt saved. Atdhe Nuhiu (Sheffield Wednesday) right footed shot from outside the box is saved in the centre of the goal. Assisted by Liam Palmer. Goal! Sheffield Wednesday 0, Norwich City 3. Teemu Pukki (Norwich City) left footed shot from the centre of the box to the centre of the goal. Assisted by Maximillian Aarons. Moritz Leitner (Norwich City) is shown the yellow card for a bad foul.